Maleic Anhydride Catalyst takes VOx and MoO as primary activity component, mixed with oxidate in inert gas, which is suitable to produce maleic anhydride from benzene. oxidate in inert gas, which is suitable to produce maleic anhydride from benzene. high quality liquid oxidation acid. and quality of liquid oxidation acid would be better. Keep away from moisture during transportation & storage. 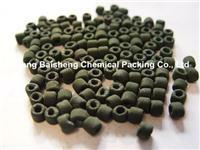 Application: petrobenzene and coking benzene could be raw material.